These complex recipes are the reason many people through in the towel while trying to be vegetarians. I checked Ottolenghi’s other recipes also and they were calling for too many ingrediants, some quite hard to find. Charles: Thanks for the comment. It has got me thinking, and I might even do a whole post on it. Yes — some vegetarian recipes call for scores of ingredients. From time to time, I flip through “One Spice, Two Spice,” the cookbook written by Floyd Cardozo, the chef at my favorite though now closed Indian restaurant in NYC, Tabla. Many of the recipes look delicious. Some I know are delicious because I’ve tasted them at Tabla. But I never get around to making them. And grinding my own spices? Not gonna happen. That said, I don’t think Cardoz’s vegetarian dishes require more ingredients than those with meat. Rather, I think some cuisines require more spices than others. Indian being one. (Although a “curry” powder, so easily available in US stores, simplifies it for many cooks.) North African dishes also call for many spices. And while cooks in America might add a few shakes of Five Spice powder to their Chinese dishes, I’m sure Chinese cooks are adding five different spices — to tofu, chicken, and beef alike. Meanwhile, the Italians might serve pasta “alio y olio.” The ingredients: pasta, olive oil, garlic. Some add red pepper flakes. But still, it’s a classic (if not terribly exciting) vegetarian dish with three basic ingredients. So while I don’t agree with you that vegetarian meals inherently require more ingredients, I wonder if some cuisines that have traditionally depended more on/taken better advantage of vegetables — and are therefore cuisines that new vegetarian cooks look to — also happen to be ones that use lots of spices. Thoughts? 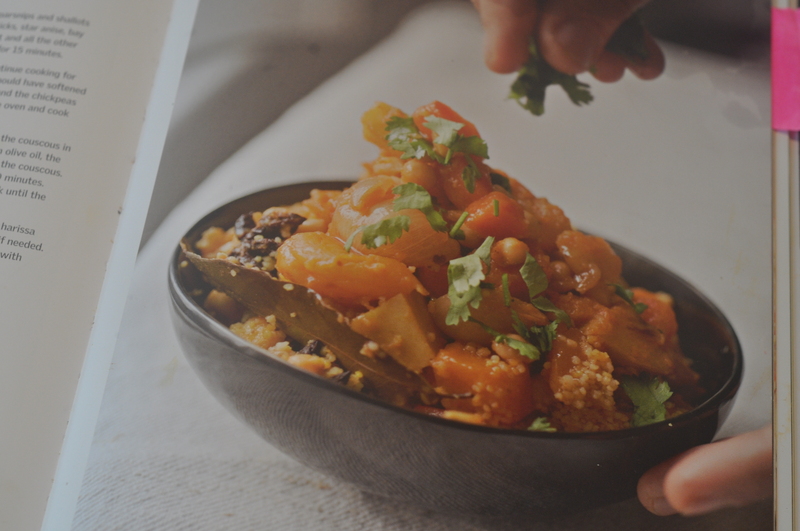 What you have said is true – however I think Ottolenghi’s recipes cross the Rubion! I have been a vegetarion since 1973, back in the days where the best you could usually do was a dinner role and, if lucky, some salad at business lunches or dinners. Today of course you can go everywhere. I understand and agree with special recipes for special occasions. During the holidays no one objects to running to the specialty store to pick up an odd spice or two (Ras El Hanout). But for every day cooking it has to fall into a relatively simple-to-do category for the recipe to stick. In reviewing Ottolenghi’s recipe again I see it could be done with some shortcuts but when first trying a recipe we try to follow the letter of the law and this recipe was a bit too much. There is a good reason that Giada’s Everyday Italian and Rachel Ray’s 30 Minute Meals have been very successful – in today’s world working families don’t have the time to prepare complex meals. So it becomes a daily issue of something simple at home or fast food and believe me, kids will lobby for fast food most of the time. I like your blog and I am happy that I have access to it. I love couscous! It’s definitly one of my favorite grains.